Yay, it's WFW's again! I haven't participated in awhile just simply because of a crazy schedule but I'm so glad I'm doing it again today. 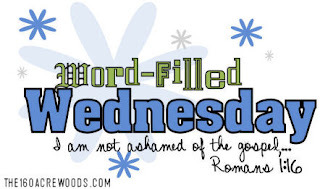 Sometimes I can get carried away with the blogging thing (addicted at times you may say) and WFW's gives me a way to honor and glorify God through blogging. How cool is that? If you would like to join just visit 100AcreWoods. So my verse this weeks is Proverbs 3:5-6. This is one that the girls in my accountability small group suggested for me. I have been trying to memorize it by carrying it on a note card in my pocket with me all day. I pull it out and read it at times I feel myself getting stressed, angry, worried or pretty much any emotion that's conveying that I'm not completely trusting Him. This verse is such a great reminder to me that God loves me so much and wants to bless me if only I would trust in Him and follow His lead. 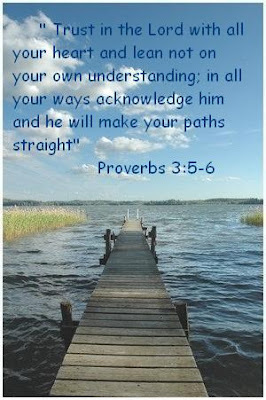 He will guide my path and set me on solid ground but I have to be willing to follow Him instead of making my own trail. I find it tempting to just forge ahead through life without really stopping to reflect on God's word or pray before a decision is made. I have learned many lessons that are a result of doing the OPPOSITE of this verse. So I can tell you going your own way and trusting in yourself to do things does not work! Thank you Lord for being my great Counselor! How wonderful that you jumped back in again to do a post (kinda like someone else I know who is typing this) I enjoy hearing your thoughts on things. Thank you! One of my favorite verses, love the picture. This is a wonderful verse and you did it great. Picture is also nice. Thanks for sharing. My first entry is up too. I love this verse. That is beautiful. I tried to follow your blog, but it wouldn't let me click on that option. I hope I can find you again and try later. You are a dedicated soul and my life is lucky to have you. I need to follow your lead and find a verse to study learn and live by! This is a great verse to memorize. God's Word for me this year is Colossians 4:2. Great picture and Scripture and simply awesome post! Happy WFW! This is such a great verse to call to mind during times of stress. I love your idea of carrying it with you. Great verse! And what a great representation of trust!! I love that... it is my boys memory verse this week! I love this verse. And, the picture you chose to go with it is perfect. It seems such a simple thing to do and yet I often find myself wandering off in my own direction. I couldn't think of a better scripture. This is one of my favs. I refer to it very often!! Thanks for sharing!! great verse today! one of my favorites as well! Oops, I gues that's what having kids will get you huh? I think it is one of the best verses in the bible. Simply because some things we just don't understand and question. Thanks for sharing. Beautiful photo, and I love the verse that you put with it. Great WFW addition!